The tricep pushdown doesn’t go astray in a workout regime of anybody who is looking for serious arm mass and strength. It’s simply not enough to have sizable biceps; triceps are equally as important, and the tricep pushdown is known to deliver favorable results! But what if you don’t have access to a cable machine and are unable to perform this well-loved tricep exercise? Are there effective alternatives to the tricep pushdown? Absolutely, yes! There are a few ways to get around the hurdle of not having a cable machine to allow for this exercise to be performed. And they’re just as good! I’m going to be sharing with you some of my top rated tricep exercises that are a perfect alternative to the cable pushdown. They provide similar, if not the exact same movement, and target the same muscles! But, before we look at what they are, below you will find some info on why the triceps are an important set of muscles to train, and why you should be giving all these alternatives a go! Apart from the aesthetic benefits of having a solid set of triceps, there are important functional benefits too. Triceps are synergistic muscles, meaning they are “helper muscles”. The pectoral muscles, front deltoids and triceps all work in unison to orchestrate a strong push movement. In addition to this, the triceps are valuable when it comes to lockout strength within push movements. The triceps are often overlooked when it comes to shoulder stability. Attaching directly to our shoulder blades, they play a significant role. You can read more about how tricep strength and shoulder strength are linked, here. So, as you can see, triceps are a big deal. But, no tricep pushdowns; no worries! Read on for the awesome alternatives that have your triceps covered! On a side note, these exercises can all be done easily from a home gym – bonus! The traditional cable tricep pushdown can easily be replicated with resistance bands! Some could argue that this resistance band version of the exercise is even more effective than the original, as it requires equal effort from the left and right triceps. Another benefit of the resistance band pushdown over the cable machine pushdown, is the fact that the tension is at its highest point at the end of the movement, like in the bench press. Whereas with the standard cable pushdown, tension is mostly lost at the end of the movement. To do this exercise you need a resistance band of an appropriate level of resistance, and something to anchor it to, i.e. a power rack or door anchor. 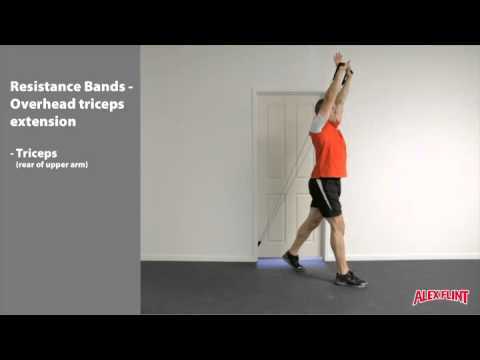 From here, assume the standard tricep pushdown position, with an end of the band in each hand. Lean forward slightly at the hips, and keeping your elbows by your side, push the bands downwards, until you have completely straightened your arms/locked out at the elbows. Hold for a second and return to the starting position slowly. This can also be a great warm-up exercise if you use a band light enough to be able to pump out lots of reps! 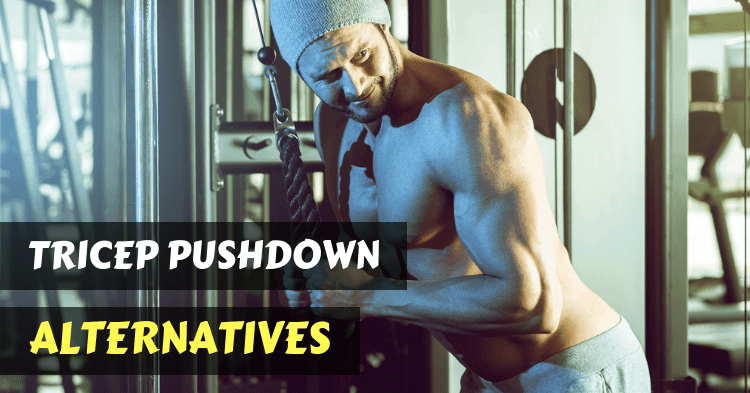 The tricep pushdown in reverse – overhead tricep extensions! This exercise is commonly done on a cable machine but can be done just as effectively (if not more so) with a resistance band! Going overhead will fatigue your triceps faster than your banded tricep pushdown, so aim for a lighter band, and some extra reps.
Make sure your resistance band is anchored well to the bottom of a rack or door. Holding an end in each hand, face away from the anchor in a split stance with a neutral spine. Have your arms overhead and elbows bent. Note, it is important to keep your shoulders still, and your elbows tucked in, to maximize the load placed on the triceps. From here, push the bands away from you until your triceps are fully contracted. With this exercise, you should be mindful with the weight you choose. Overdoing it could end in injured elbows, so lift within your capacity! To perform this exercise correctly, lie on a flat bench with a dumbbell in each hand. Begin with your arms raised above your chest, arms shoulder width apart and palms facing each other. From here, bend at the elbows and lower the dumbbells down as far as you can go, whilst keeping your shoulders static. Once you reach the end of the movement (at which stage the dumbbells should be somewhere around your ears), straighten your arms again until your elbows are locked out. As with the overhead extensions, keep your elbows inwards rather than letting them flare outwards whilst pushing the weights back up to starting position. I like to do this exercise with maximum weight for 8 to 10 reps. If you’re looking for some dumbbells for your home gym to do exercises like this one, you can have a look at some here. When it comes to alternatives to the tricep pushdown, especially for building chiseled triceps, one can’t not touch on the close grip bench press! This variation of the traditional bench press is a powerful exercise that will give your triceps a run for their money. The close grip bench press makes for a perfect strength exercise, and in my opinion, is best performed for maximum weight, over less reps.
To perform this exercise, lie on a flat bench with your knees bent and feet on the floor. Assume a shoulder-width grip on the barbell. Avoid taking too close a grip, as this can place unnecessary strain on your wrists. From here, whilst keeping your core engaged, and your shoulder blades together for stability, lower the barbell down to your sternum. At the bottom of the movement hold for one second, and then explosively push the barbell back up. Keep your elbows close to your side for the safest and most effective close grip bench press. And make sure you make use of a safety rack and/or a spotter when performing these heavier lifts! TRX cables are amazing for building functional strength! And this exercise is not for the faint-hearted. I love this alternative to the tricep pushdown, not only because it requires full body activation, but because it provides endless room for progression – you can adjust the amount of your body weight you’re loading by the position of your feet in relation to the TRX anchor. As with most exercises in which you are in full control of stabilizing your body, the technique is everything. So, make sure you watch the demonstration video below to stay safe! 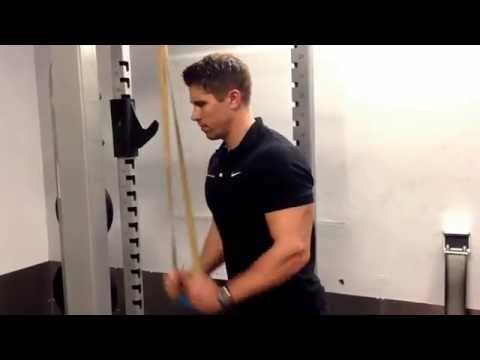 Like the tricep pushdown, this exercise follows the same movement pattern. However, unlike the tricep pushdown, this alternative requires the tension to be “on” all the time. Think of it as the much harder version! To perform this exercise, facing away from the anchor point, have a handle in each hand on fully extended arms in front of you at eye level. You should be leaning into the cables with your body weight supported by the TRX. Keeping your core engaged at all times, lower your body towards the floor by bending at the elbows. Avoid having your elbows flare out whilst your hands move towards your head. Once you reach a (just under) 90-degree bend in the elbows, contract the triceps by pushing your hands away from your face, extending your arms and raising your body. Don’t do more reps than you can handle, as your lower back will suffer the consequences. And remember, the further away your feet are from the anchor point, the easier it will be. Start slow! 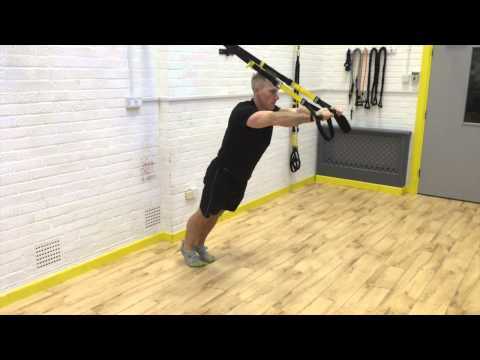 TRX cables are an amazing training tool – you can check out some other exercises you can do with them, here. A challenging bodyweight exercise that is not to be underestimated! This variation of the push up makes a great alternative to the tricep pushdown, mimicking the motion and using body weight for load. This one hits your triceps hard! For your own safety, it’s a good idea to perfect the standard push up before giving this one a shot! To do the diamond push up, start on your hands and knees and place your index fingers and thumbs together, making a diamond shape. Then get into push up position, by lifting your knees off the floor, forming a straight line from head to toe. As with a normal push up, lower your chest towards the ground. Keep your elbows close to your side as you lower down to just before your chest touches the ground. Hold for a second and then push back up to extended arms. If you can easily do 3 sets of 12, try the advanced version of this exercise by elevating your feet! As you can see, tricep pushdowns are just one of many exercises that exist to help strengthen and shape your triceps! These are 6 of the best tricep exercises out there and I hope you enjoy trying them out and working your way through their progressions. Your triceps are an important part of helping facilitate a strong push movement, so they deserve the attention! And who needs a cable machine? Because from body weight, to resistance bands, to dumbbells to barbells and TRX cables, there’s a tricep exercise for any location! What are your favorite tricep exercises? Share with us in the comments section below!